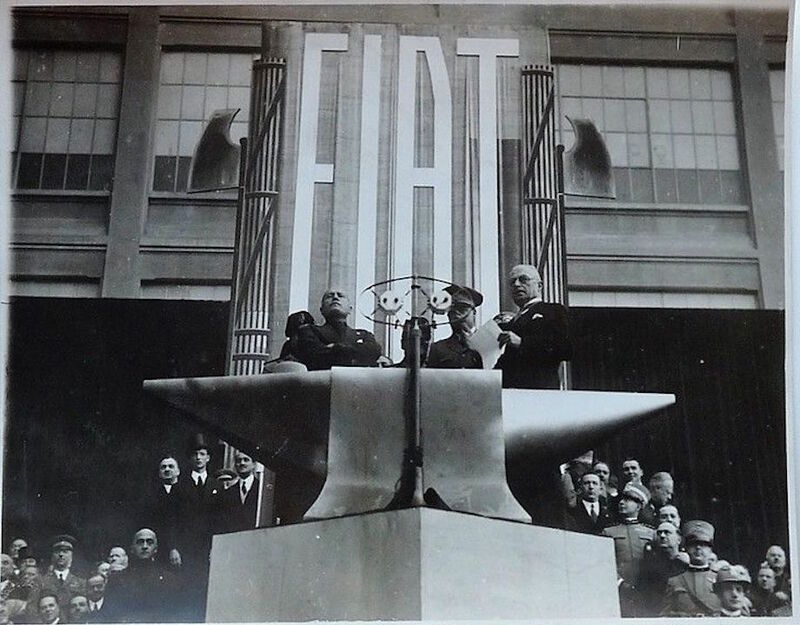 On this day in 1943, a strike in Italy’s FIAT company marked the beginning of the end for Mussolini. The strike that began in Turin on March 5, 1943, was the first blow by Italian workers against fascism. As the clock struck ten, workers at FIAT’s Mirafiori plant started to down tools, walking out of the factory. News of their defiant stand soon helped spread the action to Milan and other smaller centers of industry. This was more than just a labor strike. Piercing the cloak of fear and resignation that had for two decades allowed fascism to dominate Italy, the revolt in Turin’s war industries was the prelude to the armed resistance that followed six months later. While the action courted a violent response from the long-entrenched fascist authorities, within a week of March 5 some one hundred thousand workers were on strike. A regime on the retreat in Russia and North Africa oscillated between repression and concessions, further exposing its fading authority. Adolf Hitler slammed Benito Mussolini’s failure to crush the strike; for the Nazi tyrant, “in these cases those who show any weakness are lost.” In the palaces of Rome, elites long attached to Mussolini plotted to cast off the failed imperial adventurer. March 5, 1943, would enter history as a break in popular consent for fascism. It responded to worsening material conditions as well as the state’s loss of face as its military defeats mounted. But the strike initiative itself was extremely hazardous. Far from simply a spontaneous outpouring of discontent, the Mirafiori action was a gamble by clandestine militants operating in highly dangerous conditions. Its overall effect was to display the collective power of workers who had previously remained silent and atomized. It nurtured the hopes that would characterize the resistance itself. Before this, fascism had enjoyed real successes in monopolizing collective action. Over the interwar period its stooge unions and after-work clubs served as an integrating force, as various kinds of benefits were tied to membership. From 1926 all other parties and unions were banned, and until World War II there were only a handful of protests, which were easily crushed. Aside from the few thousand anti-fascists in prison or confino [internal exile], small minorities took an arduous stand of principle by withdrawing their children from school or refusing a Fascist Party card even at the cost of unemployment. At the beginning of World War II, the biggest anti-fascist party, the Communist PCI, had five thousand members nationally, with most of its leaders exiled in France. Only some underground groups were in contact with the Paris-based exile leadership, or even the centro interno formed in Milan in 1941. Isolated clandestine circles sustained a looser subversive culture, whether discussing old Marxist texts or “raising a glass to the imprisoned comrades” each May Day. At Mirafiori there were perhaps eighty PCI members among the twenty thousand workers, generally concentrated in the most skilled grades. With fascism entrenched, isolated militants long hoped for the outside blow that would undermine the regime. They saw first the depression and then the regime’s wars in Ethiopia and Spain as potential sources of crisis. Their experience following the Wall Street crash had, however, given PCI militants a sharp lesson in the risks of adventurism. The crash together with the Comintern’s post-1928 Third Period policy drove them to intensified agitation, in the expectation of the final capitalist crisis. The PCI’s bid to send exiled cadres back to Italy however proved disastrous: the average organizer lasted only seventeen days before arrest, and the regime rode out the storm. This itself shaped the first preparations for the Mirafiori strike. As historian Tim Mason described, after Italy joined the war in June 1940, PCI militants like Umberto Massola (founder of the centro interno) and Amerigo Clocchiatti were torn between a focus on maintaining their secret organization — saving them from infiltration but denying them a connection to the population — and the hope that military defeat would turn the masses against the regime. While Massola was more cautious, Clocchiatti urged spectacular agitation to show that the party was still active. Yet even if such agitation did attract sympathy, it also risked alerting the police to their organization. There were, however, definite signs of discontent. After two decades in which labor had been silenced, the small vanguard of PCI members feared that a population low in political consciousness would be wary of confronting the fascists. Decisive, therefore, was the convergence of the PCI militants’ own confidence that the regime was reaching a breaking point and the emergence of diffuse but real signs of resistance, from sporadic bread riots to anti-fascist graffiti. Outside factors remained key. The Soviet victory at Stalingrad, on February 2, 1943, not only enthused the militants of the PCI, but it concretized a wider popular sentiment that the war was lost. Following isolated stoppages in the first months of 1943, the PCI’s clandestine network decided to launch a concerted strike action, designed to ripple out from Mirafiori, the symbolic center of Italian industry. Connecting the disaster of the war to the wider popular malaise, the strike platform was modest. It demanded that the regime’s offer to those whose homes were destroyed by bombing — a 192-hour wage bonus — be extended to all workers. The daily air-raid siren at ten o’clock was to serve as the moment to down tools. In an attempt to confuse the strikers, the alarm in fact went unsounded. But as the clock struck ten, militants began to walk out of the plant. First to walk out, at least according to Communist legend, was the specialized machine technician Leo Lanfranco, a PCI man who had known such militants as Pietro Secchia and Umberto Terracini during his five years’ exile on the island of Ponza. A key organizer of the Turin strike, he led the Mirafiori walkout at ten o’clock, followed by some of his workmates. Yet while this action earned a place in PCI folklore, it was only a hesitating step toward a strike, for only a few dozen workers joined the action before police arrived. An action among the eight hundred Rasetti engineering workers encountered greater success, though police quickly intervened and arrested ten. Monday, March 8, was the moment that the strike really began to spread. Efforts to grow the action beyond the workplace were unsuccessful. PCI leaflets calling a protest in Piazza Castello to mark International Women’s Day — like that of St Petersburg in 1917, raising the call for peace and bread — appear to have had little effect. But the strike now spread to the railways and other factories, including in the form of a sciopero bianco [work-to-rule]. This allowed workers to strike without direct confrontation with the police, as the square protest would have risked. Rather than the PCI initiative suddenly securing mass adhesion or a sudden and spontaneous mass revolt generalized by the party, we can instead see in the strike a faltering attempt at organization, which gradually sparked awareness that striking was indeed possible. The action now resumed at Mirafiori itself, and the PCI spread it across Piedmont (the region including Turin) and then Lombardy (the region including Milan) by venerating the “example” of Mirafiori. Within a week, one hundred thousand workers were on strike, adding their own demands to the 192-hour-bonus call. A mobilizing success, the strike was heralded by the PCI’s clandestine press on March 15. Mythologized in real time as the “revolt at Mirafiori,” the strikes in the North were also used to inspire actions in other cities less endowed with industry: a peace protest by four hundred in Rome on Easter Sunday led the Pope to cancel his benediction, and leaflets distributed at the university proclaimed “long live the northern workers.” While the regime arrested some 850 workers over the course of two weeks of strikes, it was forced to concede the workers’ main demands in order to get the war industry back functioning — an obvious admission of weakness. The armed resistance would come only later, following the German invasion of September 1943. But the events of March 5 shaped this struggle in two particular ways. First, through their strike the workers asserted their centrality to anti-fascism in general, acting as a lightning rod for wider popular discontent. The movement was punctuated by a series of general strikes, mainly called by the PCI and Socialists. Second, in organizing clandestine strike committees the PCI built not only its factory base but moreover created a pole of attraction able to win over other layers, from intellectuals to disbanded soldiers. Perhaps 60 percent of partisans joined the units it formed. Mussolini was obsessed with this civilizational clash: he saw even this strike as part of a conflict between fascist Europe and the Bolshevik east. In reality, the armies preparing to invade Italy were the US and UK forces, and not the Red Army. Yet while Mussolini’s description of a popular veneration of Stalin reflected his own anti-communist paranoia, fascism’s own demonization of the USSR, and the decisive Soviet role in turning the tide of the war, it also helped galvanize the long-repressed Communists’ prestige among Italian workers. Outside intervention would indeed impose itself on Italian politics, if not in quite the way Mussolini imagined. The decisive actors were the US and UK forces, who had already in Algeria managed to secure the support of Admiral Darlan, the Vichyite governor who now ditched the Axis side. Following his example, faced with the invasion of Sicily on July 10, 1943, and the bombing of Rome nine days later, the fascist hierarchs voted to overthrow Mussolini. He was replaced by Marshal Pietro Badoglio, who immediately entered peace talks with the Allies. The peace talks were not the end of the war. When the armistice was announced, Hitler immediately moved to protect the soft underbelly of his empire, and on September 8–10 Wehrmacht forces swept across all except the far south of Italy. What followed were nineteen months of armed struggle, starting with the resistance put up by disbanded soldiers and civilians at Rome’s Porta San Paolo. Fighting ahead of the Allied front lines, the partisan forces would liberate Turin on April 25, 1945, and three days later executed Benito Mussolini and his final collaborators. For two decades condemned to silence, they had finally shaken off the regime. The PCI’s narrative of a powerful working class smashing fascism would ultimately be turned against it. In the 1960s New Left critics highlighted the contrast between workers’ central role in the resistance and the reality of postwar Italy, in which the PCI played second fiddle to the Christian Democrats. At the most extreme end, writers like Romolo Gobbi alleged that the party had taken a mass workers’ revolt and channeled it into institutional compromise, subverting the supposed revolutionary potential of events like the March 1943 strikes. Yet this account of betrayal and demobilization curiously fails to explain why workers did indeed follow the PCI’s lead. While the PCI did indeed choose the path of republican legality, forcing it into many steps of a conservative or even repressive character, there were few cases where masses of workers acted in direct contravention of the PCI’s approach. The largest dissident movements, hostile to class collaborationism, were concentrated in areas like the peripheral districts of Rome where workplace mobilization was weaker. While such movements combined anti-institutional sentiment with a real capacity to organize artisans and underclass populations, they generally lacked the political cohesion to count seriously in national politics. For most militants, the advances at the end of the war offered a real path to progress, including a new republican constitution. Citing the opening line of this document written by the anti-fascist parties, Roberto Finzi called the March 5, 1943, strike the seed of “the Republic founded on labor.” The strike had sparked the early revolt against fascism; empowered by their wartime mobilization, workers would now assert their role in the new Italy. There would be great victories and great advances in the postwar decades; the PCI was itself the second party in the republic. Yet the PCI’s critics were right to see that this ultimately created a tolerated space within a Christian Democratic–ruled Italy, rather than building a bridge to state power. Precisely because the mobilization of March 5, 1943, did not straightforwardly impose its stamp on the new republic, it is important to resist a bland consensual image of the strike, deprived of its elements of doubt and conflict. The small group of militants who actually launched the strike appeal were far from certain of popular support and did not initially get it, for they acted in the name of a collective interest that had long been carried on few shoulders. To rally workers against fascism they could not simply rely on the population’s sense of self-preservation, which was in part even a barrier to action. They recognized the factors for passivity, but also sought for the means by which higher ideals could be linked to realistic hope of success. Looking at the weakened state of the Italian left today, it is easy to draw unfavorable comparisons with the heroism of the war era. The fact that many of the PCI’s former cadres now form part of a hollow neoliberal center equally invites us to question what links that party’s earlier record to its current malaise. The PCI’s history was marked by crimes and errors as well as moments of greatness; and certainly the political visions that animated the strike of March 5, 1943, cannot simply be reenacted. But faced with a renewed reactionary onslaught, those who do identify with the victories of decades past would do well to recover the optimism and ambition which drove this great revolt against fascism.